Being born in Glasgow but raised in Renfrew from the age of 5, I have always been fascinated by the shipyards of the Clyde, particularly those in the vicinity of where I lived in Renfrew. I lived close to the river and the 3 yards whose racket I lived with every day were Lobnitz &Co, Simons&Co, and MacLeans. I have been studying the history of Lobnitz shipping particularly for some years and found many interesting stories of their ships and others that were built and launched from these small but important shipyards. I thought these wee stories might interest some - if not, I could talk about farthings instead! In the early hours of June 6th 1944, or as we all know it, 'D-Day' commenced with the Allied Forces landing in France. The Naval fleet was the greatest armada in history and comprised about 5,000 vessels of all kinds from battleships to landing-craft. This massive force formed up along the English Channel from various bases along the coast and were shepherded by the Royal Navy towards the beaches of Normanday. 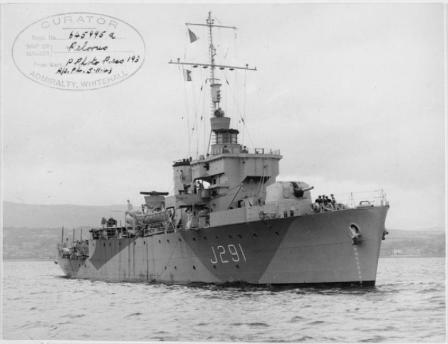 It may come as a surprise to you, that the small ship assigned to lead this great naval force was a minesweeper, HMS PELORUS, which was built by Lobnitz & Co in Renfrew and launched on 19th June 1943. PELORUS was an Algerine Class minesweeper, but spent most of her time on Atlantic convoy duties. On D-Day, HMS PELORUS was commanded by Commodore George Nelson DSC RN. As the ships headed out towards Normandy from Portsmouth, the Commander-in-Chief, Admiral Ramsey flashed the message 'Good luck. Sweep on relentlessly' to the line of minesweepers led by PELORUS, . HMS PELORUS replied 'Aye Aye sir,with NELSON in the lead'. Pelorus led the invasion fleet and arrived first, on time, and in exactly the right place. Great service by the Royal Navy in a Clyde-built ship and everyone in Lobnitz was very proud that day as the above story was printed in all the national papers. After later service with many years in the South African Navy, she was scuttled on 12 November 1994 to make an artificial reef for leisure diving at Miller's Point near Simonstown, South Africa, another name which has strong links to the Royal Navy. So she lives on, still giving good service. Rab, as you have such knowledge of shipbuilding, I wonder if you know anything about Clyde workers being sent to the US? My grandfather was in New York, The Bronx, for a while and it was something to do with ships during the war. Any ideas? I've often wondered but there's no-one around that I can ask. I have never heard of any such programme Betsy. However, it is always possible that some exchange of workers may have taken place. The Americans pioneered welded ships and the Liberty Ships were produced in enormous numbers to ferry supplies across the Atlantic. It may be that some of our men, like your Grandfather, went over to study this method of shipbuilding but I know of nothing specific. Another bit of Lobnitz wartime ingenuity was the design and construction of the pierheads of the giant Mulberry Harbour at Omaha Beach after D-Day. Winston Churchill ordered that a method had to be found to construct a temporary harbour to unload the neccessary supplies to feed the invasion of Europe. Lobnitz&Co. got the contract! Unfortunately, this mammoth undertaking which took a year to plan and 22,000 men to build lasted only 3 days after a storm wrecked it subsequent to D-Day! However, it was soon repaired and went on to play a major part in the invasion. Rab, there were many British shipyard workers sent to do specific jobs over in the States, and many were from Govan. After the sinking of the Bismark the 16" gun Rodney had fired her heavy guns so much that the vibrations had badly damaged herself with loose plates and the likes (probably more than it did the Bismark... [now just 'probably'] ). Another example was when the Queen Mary had cut a Royal Navy anti-aircraft ship in two in the Irish Sea (??). The QM's bow, as you can imagine, was badly damaged and she had to go into Boston in the States for repairs. British personnel were involved in this repair but I'd guess only as advisors. Regarding your interesting comments about the giant Mulberry Harbour, I had a good friend in Govan who worked at Fairfiels as a carpenter, and he was sent down to England to work on the construction of the Mulberry Harbour close to D-Day. Might mention too, that he was taken out of Fairfields and sent down to London at the height of the Blitz to repair houses--- said he spent a whole month doing nothing but putting doors on houses. He was working on the Beatty at the time he was sent down to London.... hmmmmm, makes you wonder. Thank you Rab and Dugald. My grandfather was a riveter so that sounds right. My late aunt worked in the shipyards during the war and went on to have a good life with her own business.Best of health till her mid 70 when she developed a cough.Sadly she passed away and the cause given was asbestos related. I was given advice by kind people from a group formed for this very thing.I thought of her working away in the yards inhaling poison.Im sure here were/are many similar instances. Thank you Thh! A blast from the past indeed. I even recognised the voice of the narrator. Geez, when one sees all these gigantic capital ships and the money they must have cost... wow. what a waste! Even when the war was winding down John Brown's was still working on Britain's last battleship, the Vanguard--- a beautiful looking ship, but already an anachronism. Very interesting indeed, Wellfield. If there is one other way I'd dearly have liked to have got married, that would have been on the Queen Mary, and I mean the one on which you got married,not the wee one on the Clyde (although come to think of it, that wouldn't have been bad either). I spent my honeymoon in New York city and while there we visited the Queen Mary which happened to be docked while we were there. The closest I ever got to her was when I managed to stretch out and touch her rusting hull. I'd seen her so often at the Tail o' the Bank, but never this close. The only Cunard thing I came away with was a colour print of the Queen Elizabeth, which has hung in my house ever since. (Oh, I've got one of the "Mary" too, but it lacks the significance of New York). I don't think British shipyard workers you mention are the ones to which Betsy was referring. The ones you mention were really just emigrants to the States from the UK., whereas she was talking about those sent over from British yards for specific reasons and I'd guess, with respect to British ships. The same thing happened in the British aircraft industry. Got the offer of a job myself in California, but I'd have had to first join their Air Force for four years, and that was not on! I recall the latter days of the American civilian shipyard industry. I think it was the super liner "United States", (and she really was super!) that made its maiden voyage just about the same time the British Comet jet airliner made its first scheduled jet-aircraft flight across the Atlantic. The Comet signaled the end of the transatlantic luxury liner competition, and also the end of the American civilian shipyard industry. Now their shipbuilding is all military and I'd guess, about as big as its ever been. Only three warships of the Royal Navy in WW1 still survive as preserved vessels. If you visit London, you may see a very smart ship moored alongside The Embankment. This is HMS PRESIDENT. She was built by Lobnitz & Co. of Renfrew in 1918 and launched as HMS SAXIFRAGE, a Flower-Class 'Q-ship'. Q-ships, also known as Q-boats, decoy vessels, special service ships, or mystery ships, were heavily armed merchant ships with concealed weaponry, designed to lure submarines into making surface attacks. This gave Q-ships the chance to open fire and sink them. The basic ethos of every Q-ship was to be a wolf in sheep's clothing. In 1922 she was moored permanently on the Thames at Blackfriars, and became a Royal Naval Reserve Drill ship for sixty-five years. Her new name, HMS President, was inherited from the first London naval reserve Drill ship: the "Old President" of 1832-1903, whose name celebrated the capture of both the French frigate Président in 1806, and the American 'super-frigate' USS President in 1815. 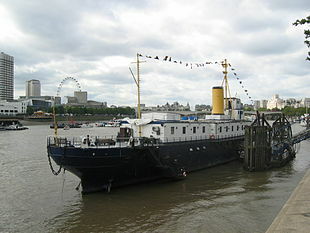 HMS President (1918) remained in Royal Navy service for a total of seventy years, from 1918-88. She was the last Royal Navy warship to wear Victorian battleship livery : black hull, white superstructure and RN buff yellow funnel and masts. Since 1988 she has had various private owners and is presently a museum.